This unique line was built in 1905 for the transportation of the raw materials required for the manufacture of paper and, of course, the finished product. The line which is built to a gauge of 2′ 6″, continues to use the steam engines and rolling stock that were supplied to operate the railway in its working life prior to preservation in 1969 – fifty years ago this year. How many other railways can claim that they operate the original engines on part of the original line with original rolling stock? The staff are not original but are all volunteers and new members are always welcome. Wherever you see orange text this is a shortcut to another part of the website or other media, for example, to visit the Away Sales Events page click on the orange text. To find out what’s happening this week see the Latest News section on the right of this page or subscribe to our weekly newsletter. 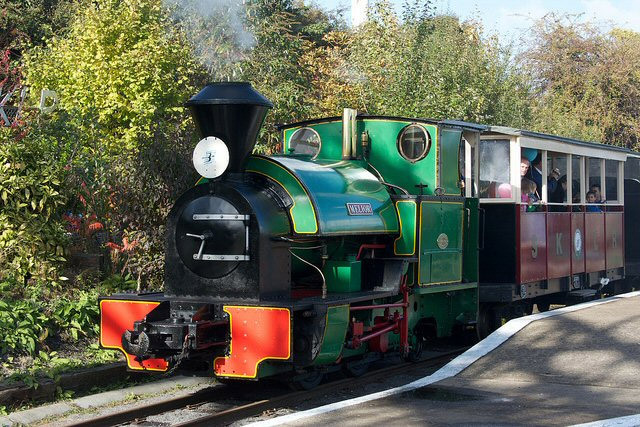 Trains are now running every Sunday and Bank Holiday Monday (plus Wednesdays in the school May Half Term and Summer Holidays (end of July to end of August)) until the end of September. Our 2019 timetable has now been published and can be downloaded here or click on the leaflet cover photo. The next event at the Railway is: Jack the Station Cat and Edward Bear Weekend with Swale Cats Protection on Sunday/Monday 5/6th May. In 2017, we joined the Wheels of Time initiative to encourage children aged 5 to 11 to visit and explore heritage sites across Kent to earn exclusive badges and Kent Children’s University credits and we are offering this again this year. Wheels of Time has expanded again to include more museums and heritage sites, including Elham Valley Railway Museum which houses the magnificent scale model of Cheriton Eurotunnel terminal, a replica signal box and its own miniature railway. Children complete a free activity sheet and search Kemsley Down for the answers, it will be available throughout this season and requires a visit of at least two hours to complete. the Alpha Fund to raise money to cosmetically restore Alpha ahead of full restoration in the late 2020s by today’s younger members. Please note that our postcode for Sat. Nav. users is ME10 2XD – click here for directions to Sittingbourne Viaduct station. We will try to run to the timetable, on the days shown and use steam locomotives but reserve the right to change these for operational reasons, without notice. Our accessibility statement can be found here.